An Indian government-issued death certificate obtained by CoinDesk corroborates QuadrigaCX’s account of the passing of CEO Gerald Cotten in early December. Cotten’s death is at the center of the turmoil surrounding the Canada-based crypto exchange, which went offline last week owing $190 million to its thousands of customers and is now seeking creditor protection in a Novia Scotia court. Some customers and observers have expressed skepticism about reports of Cotten’s death, given that QuadrigaCX took more than a month to disclose it, that the disclosure followed a long period of fiat and crypto withdrawal delays, and that the company did not provide documentation of his passing. 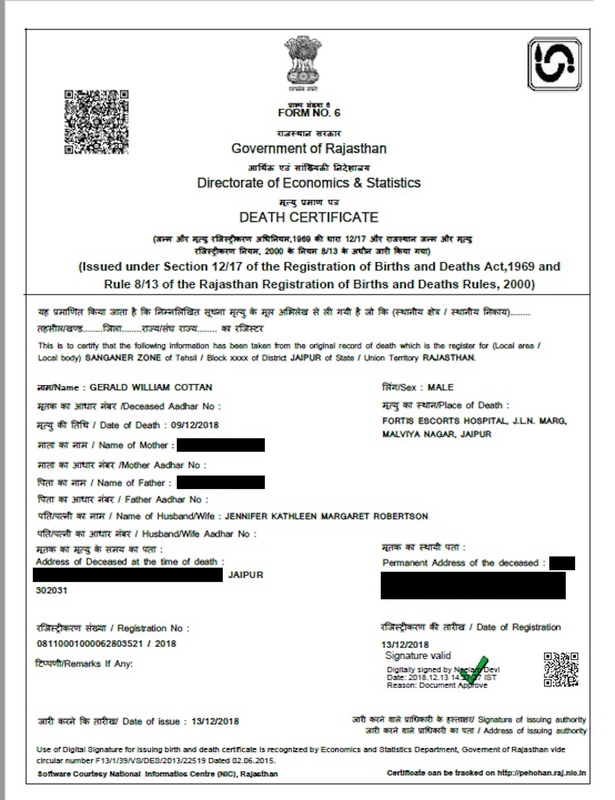 But the death certificate, issued by the Government of Rajasthan’s Directorate of Economics and Statistics and obtained from a source involved in the events, indicates that Cotten died on Dec. 9 – the same date given in a Dec. 12 statement of death from a Halifax funeral home filed in the Nova Scotia court by his wife, Jennifer Robertson. The death certificate, issued on Dec. 13, identifies him as “Gerald William Cottan” and names Robertson as his wife. QuadrigaCX said in mid-January that Cotten had died while traveling in India due to complications from Crohn’s disease. At the time, Global Affairs Canada – the government agency that manages diplomatic relations – seemed to confirm Cotten’s death, but only in vague terms. Then came last week’s revelation that QuadrigaCX owes more than $100 million worth of cryptocurrency to its customers but is unable to repay because Cotten had sole control of the private keys connected to those funds. Robertson said in court filings that while she is in possession of Cotten’s laptop, it is encrypted and is currently inaccessible. Amid the turmoil and uncertainty, various theories – including speculation that he had faked his death and fled with the exchange’s funds – have floated around on social media. Yet the Rajasthan document is the strongest evidence yet for QuadrigaCX’s story, having been obtained from the government office responsible for tracking such information. The document identifies Fortis Escorts Hospital, in the city of Jaipur, as the place of death. As of press time, Fortis Escorts Hospital could not be reached for comment. Editor’s Note: Elements of the death certificate, including the deceased’s address and the names of his parents, have been redacted by CoinDesk.